Portraits of all Windsor mayors are on permanent display at New Windsor City Hall, May 26, 2018. Photo by Mark Brown/Blackburn News. Visitors to Windsor’s New City Hall will get a glimpse into the city’s past. For the first time, visitors will be able to follow a timeline of Windsor’s history through its mayors. The city is putting on permanent display an exhibition of portraits, one for each of the city’s 34 mayors. It starts with Oscar Fleming, the first mayor of what would become the city of Windsor, elected in 1891, and ends with the current mayor, Drew Dilkens. It also features Windsor’s longest-serving mayors, such as Arthur Reaume and Michael Hurst, its first female mayor in Elizabeth Kishkon, and its youngest, Eddie Francis. The timeline spans 21 Canadian prime ministers and 23 Ontario premiers. At least three of the mayors, David Croll, Michael Patrick and Kishkon; hosted visits by the British monarch. Each portrait features a biography of each mayor. Some of the interesting tidbits featured include the mayor with the shortest term of office, Thomas Brophey’s eight days in 1951; and the race decided by a draw from a deck of cards, which put William Riggs in the mayor’s office for four months in 1969. 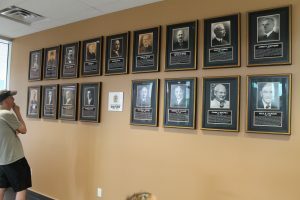 While the portraits are being displayed, the Windsor Public Library is putting together a profile on each of Windsor’s mayors for its website, in a portal listing famous and influential people from Windsor. The library is consistently adding famous names to the roster. 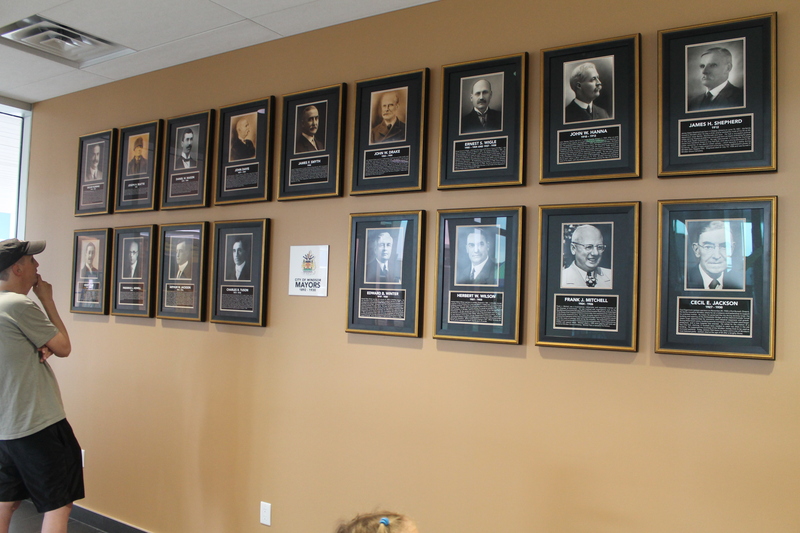 In addition to all of Windsor’s mayors, the portal also features politicians from Windsor who made their mark at provincial and federal level, as well as authors, athletes, entertainers and others. The portrait gallery can be seen in the City Hall lobby anytime the building is open. Visit the WPL website for more on the Famous Windsorites portal.